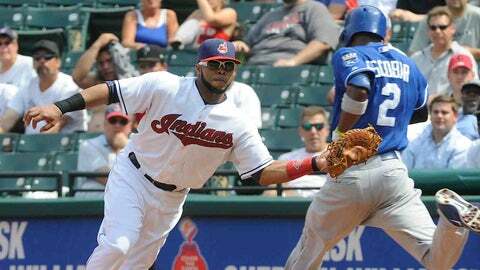 Sep 11, 2013; Cleveland, OH, USA; Kansas City Royals shortstop Alcides Escobar (2) is safe at first as Cleveland Indians first baseman Carlos Santana (41) fields the throw from Cleveland Indians third baseman Lonnie Chisenhall (not pictured) during the fourth inning at Progressive Field. In the game of offseason musical chairs with regard to positions, baseball teams do this in order to maximize the talent they put on the field on a daily basis. We have seen the Indians do this in many cases already as John Axford is the new closer, Josh Outman the new secondary left-handed reliever, Cody Allen the new setup man, Ryan Raburn and David Murphy have formed a platoon to be the new right fielder and Yan Gomes is the new starting catcher. These positional changes were made to improve the strength of the lineup, the defense on the field and the late inning options in the bullpen. Whether or not these changes result in an improvement remains to be seen and the narrative of the 2014 season will spell that out clearly for all to see in the win-loss column. But of all the moves the Indians have made this offseason, the move of Carlos Santana to third base as at least a part-time option may end up the most significant because of how it affects the roster in so many ways. With Gomes as the starting catcher and Nick Swisher entrenched as the regular first baseman, this left Santana as the designated hitter with spot opportunities to play in the field as a backup to Swisher and Gomes. But Santana is only 27 years old and just entering the prime of his career, so limiting him to a DH-only role is something that would probably be counterproductive, especially if he could fit in the field at another position. Enter the third base experiment this offseason. When reviewing their lineup and defense, the biggest question marks for the Indians going into the offseason were what to do at third base and right field. With Michael Brantley in left field, Michael Bourn in center field, Asdrubal Cabrera at shortstop, and Jason Kipnis at second base to go along with Swisher at first base and Gomes at catcher, they have established options or good second-year players at those positions they feel comfortable with going into the season. But when the Indians signed Murphy to combine with Raburn in a platoon in right field it effectively left third base as the only position in question going into the season. The Indians do have former number one prospect Lonnie Chisenhall as an option there, but his comfort level with the team and his expectations going forward have taken a hit after inconsistent seasons the last three years where he has combined to hit .244 with a .694 OPS in 203 major league games. Chisenhall is still an option at third base and very well may be the regular this season, but the addition of Santana into the role as a part-timer to sit Chisenhall against lefties adds some intrigue as spring training nears; especially with some of the reports flying around how Santana might even become the starter forcing Chisenhall to Triple-A. Those reports are probably a little premature at the moment, but it does offer up a world of interesting opportunities that can arise if Santana becomes the regular third baseman or even just a part-timer. First off, assuming Santana continues to prove he can handle the position, it helps fill a giant gaping hole in the organization because outside of starting pitching the second worst position from Cleveland down to the lower levels of the minors is third base. With no internal solutions available in the near future beyond Chisenhall, the organization would have to go the trade or free agency route to fill the position later this season or next offseason if Chisenhall were to struggle again or get hurt. It can be expensive to work in the trade and free agent market, so if Santana is able to help plug the hole it can allow real dollars and prospect currency to go toward deals to fill other areas of need. Secondly, the move creates a clear path for the Indians to get two of their brighter upcoming stars into the lineup. The first being Gomes, who broke out last season and established himself as a core player going forward and potentially one of the top catchers in the game for years to come so long as he continues his growth this season and does not have a setback. The other player being hulking first baseman Jesus Aguilar, who had a big year at Double-A Akron last season (.275 AVG, 16 HR, 105 RBI, .776 OPS) and destroyed pitching in 68 games in the Venezuela Winter League this offseason (.330 AVG, 22 HR, 61 RBI, 1.018 OPS). Having Gomes in the lineup more regularly paid off down the stretch last season because of the excellent defense he provides but also the production possibilities he brings with his bat. Aguilar may need to start the year in Triple-A, but the Indians have a clear need for a middle-of-the-order, run-producing power bat from the right side. If he translates to the major leagues as quickly as Gomes did last season, he could be the missing piece to forging together what looks like one of the better lineups in all of baseball. A year ago it would have been unheard of to play Santana at third base, but after the Tigers survived the season with Miguel Cabrera at the position last year that thinking has changed. Many thought the Tigers would struggle immensely with Cabrera at the hot corner, and while he wasn’t the most gifted defender at third base he proved to be not as much of a detractor defensively as many believed he would be and his offense did not suffer. The Indians know that they will probably have some defensive issues at third with Santana, but then again, it is not like Chisenhall, Mark Reynolds and Mike Aviles combined to do all that much last season either. The trio combined to play all but 38 innings at third bas and in total made 18 errors and had a .951 fielding percentage, a little below league average last season. In other words, there may be some growing pains with Santana at the position, but so long as he proves capable of playing there the results defensively should not be too far from what the Indians had last season. The defensive limitations are something that can be lived with when the bat it performing at an elite level, something that fans will remember when Reynolds was on his huge offensive tear for the first six weeks of last season. Several questions with the position change for Santana remain. Will Santana actually end up playing some third base this season? How far are the Indians willing to take it? Can he handle it on a regular basis? If he is a part-timer, does it hurt his performance at the plate bouncing around from position to position? If he is the regular, what happens to Chisenhall? Also, who becomes the backup catcher to Gomes? All of these questions and then some will be answered this spring, but suddenly spring training got a lot more exciting and the possibilities with the lineup much more interesting. It will be interesting to see just what exactly happens this spring once all the media descends upon Goodyear and most of the true intentions with Santana’s third base experiment become known.